Album Review: Pink Flamingo Rhythm Revue - "S/T"
Having achieved success with previous projects in Ghost Beach and TV/TV, Brooklyn-based artist Eric “Doc” Mendelsohn inhabited a style and persona purely his own for his next move. 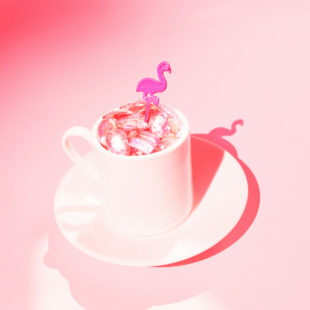 Undeniable grooves, sparkling synths and Mendelsohn’s distinct croon highlight the world of Pink Flamingo Rhythm Revue who now share their debut, self-titled EP (buy/stream). Across the short player’s five tracks, Pink Flamingo Rhythm Revue showcases a breadth in scope while still adhering to a central aesthetic, brilliantly weaving through tales centered on desire, lovelorn hopelessness and nights to never forget. In fact, the whole EP plays like a rollercoaster of a night in five parts. “Pink Flamingos (Yours Truly)” kicks right out of the gate with Mendelsohn ready to be taken “where the lights hang low” as Prince-style, choppy guitars soundtrack a New York City shuffle to the bar, club, etc. The whole thing builds and swells to a brilliant breakdown transporting you to the next vibe. With that introspection, why not give it one last go? The penultimate track and super smooth “Cocktails, Lies & Cheap Romance” arrives straight out of your favorite neon-tinged memories with glimmering synths and popping rhythms leading the way. Our maybe-not-so-humble protagonist tries to earn someone’s favor among several suitors, but the attempt leaves him feeling disingenuous and envious by the end. If you’re looking for a companion to your next night out, bad decisions, reconciliations or all three, Pink Flamingo Rhythm Revue’s great debut EP is down to ride. It’s available now, in full, via YouTooCanWoo.